New York - (September 24, 2014) - Sumthing Else Music Works, the premier record label dedicated to video game soundtracks, in partnership with Disney Interactive and Harmonix, today announced plans to release the "Disney Fantasia: Music Evolved Original Soundtrack," featuring the original score and classical music selections from the award-winning musical motion game arriving October 21. 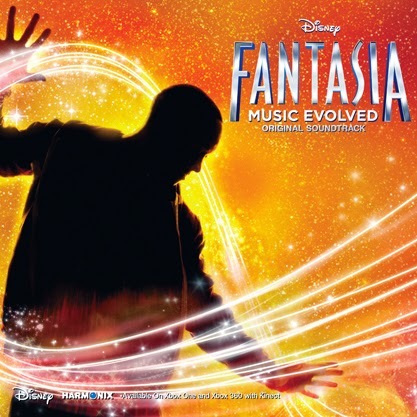 Developed by Harmonix, the innovative minds pioneering new ways for users to connect to music through gameplay, "Disney Fantasia: Music Evolved" is a breakthrough musical motion video game inspired by Walt Disney's classic animated film "Fantasia." The "Disney Fantasia: Music Evolved Original Soundtrack" will be available for streaming, digital download and physical CD on October 21. In "Disney Fantasia: Music Evolved", players enter the magical realms of Fantasia, selected by the legendary sorcerer Yen Sid to hone their musical and magical prowess as his new apprentice. "Disney Fantasia: Music Evolved" takes players on an interactive and immersive motion-controlled journey through worlds of music and magic, unleashing their creativity along the way. The album comprises the game's orchestral themes scored by award-winning composer Inon Zur and the music team at Harmonix, alongside new performances of classical masterpieces recorded with the London Symphony Orchestra, Academy of St. Martin In The Fields and Chamber Orchestra of London at the famed Abbey Road Studios. "The Disney Fantasia: Music Evolved soundtrack is a perfect marriage of classical music and contemporary game score that will take listeners on an animated journey through the layered worlds of the modern Fantasia with the timeless feel of the original property." - Gwen Bethel Riley, Head of Business Affairs Music, Disney Interactive. A "Director's Cut" soundtrack, will offer exclusive remixes of the classical selections and original score B-sides for collectors who want to experience Fantasia "unlocked". The Director's Cut will be released for digital download exclusively on Sumthing.com. "Disney Fantasia: Music Evolved" is rated "E10+" by the ESRB and will be available October 21, 2014 for $59.99 for the Xbox One and for $49.99 for Kinect for Xbox 360. For additional information about "Disney Fantasia: Music Evolved," join the Facebook community at https://www.facebook.com/fantasiagame, follow us on Twitter and Instagram @FantasiaGame and view all videos on our YouTube channel at http://youtube.com/FantasiaGame.